TORONTO, ON --(Marketwired - July 07, 2016) - Enirgi Group Corporation ("Enirgi Group" or the "Company") is pleased to announce the positive results of its Definitive Feasibility Study (the "DFS") for its planned 50,000 tonne per annum lithium carbonate processing plant at its Salar del Rincón development project located in the province of Salta, Argentina (the "Rincón Project"). Enirgi Group owns 100% of the Rincón Project through its wholly owned subsidiary ADY Resources Limited ("ADY"). The Rincón Project's lithium carbonate processing plant is designed to produce battery grade lithium carbonate directly from raw, unconcentrated brine and will use Enirgi Group's proprietary lithium extraction technology, developed in-house by Enirgi Group's Innovation Division in cooperation with the Australian Nuclear Science and Technology Organisation ("ANSTO"). Enirgi Group retained SRK Consulting (U.S.), Inc. ("SRK") to summarize the DFS in the form of a technical report prepared in accordance with National Instrument 43-101 - Standards of Disclosure for Mineral Projects ("NI 43-101") of the Canadian Securities Administrators (the "2016 NI 43-101 Technical Report"). *All amounts are in United States dollars, unless otherwise indicated. Figures are rounded. A complete summary of the mineral resource estimate and probable reserve estimate can be found in Table 1 and Table 2, respectively, of this news release. All environmental and construction permit approval processes on track to meet expanded 50,000 tonne per annum production ramp up schedule with all impacts mitigated. The 2016 NI 43-101 Technical Report was authored by SRK, Schlumberger Water Services ("SWS"), ANSTO and Prudentia Process Consulting and is dated June 3, 2016 with an effective date of February 24, 2016. The technical information in this news release is summarized or extracted from the 2016 NI 43-101 Technical Report and is subject to the assumptions and qualifications contained in the 2016 NI 43-101 Technical Report. In conjunction with the DFS work, Enirgi Group's Innovation Division has focused on delivering its proprietary, game-changing lithium extraction technology, which is capable of producing battery grade lithium carbonate product by directly extracting lithium from raw, unconcentrated brine and processing it to the end product within 24 hours, at a low cost and with a lower environmental impact than standard processing technologies. Mr. Wayne Richardson, President and CEO of Enirgi Group commented, "We were confident that we had a high quality intergenerational lithium resource and the positive outcomes from the DFS have confirmed our confidence and the value of our investment to date. Enirgi Group has invested the time, effort and money into identifying exactly what we have in terms of lithium atoms and has established the ability to actually extract brine to feed our planned 50,000 tonne per annum production plant. We have a significant, scalable resource and our proprietary processing technology has been validated by a leading independent international technology group (ANSTO). Enirgi Group has done the hard work and is well positioned to become one of the world's leading producers of high grade lithium." Enirgi Group has completed comprehensive exploration and metallurgical work and extensive technical, design, and engineering studies and the positive results of the DFS support the Company's significant investment to date and advancement of the Rincón Project. The next milestone is to commence production at a demonstration plant level of lithium carbonate in-situ on the Salar del Rincón in Q1 2017 to demonstrate the full lithium extraction process and technology. In parallel with the work to achieve this, Enirgi Group's Innovation Division will finalize the commercial plant design, commence detailed plant engineering, and complete engineering activities relating to gas supply and construction of a gas pipeline for the Rincón Project. The current resource and reserve estimates underpin plans to maintain 50,000 tonnes LCE per annum for 24.5 years, however, Enirgi Group is confident in converting significant inferred resources that will provide the opportunity to expand production or extend the life of the operation. Option to apply technology to other lithium-bearing brine resources. Enirgi Group's Innovation Division, in cooperation with ANSTO, began working on its proprietary lithium extraction process in 2013 with the goal of producing high grade lithium carbonate directly from raw unconcentrated brine. On October 29, 2014, the Company announced it had developed and validated its proprietary lithium extraction technology. To demonstrate and validate the proprietary lithium extraction process, extensive metallurgical test work was carried out on brines sourced from the Salar del Rincón, which were tested on site in Argentina and at ANSTO Minerals in Australia. In addition, a scalable demonstration plant was constructed in Sydney, Australia to confirm plant design and engineering. The demonstration plant was operated for 12 consecutive days with brine sourced directly from the Salar del Rincón. The plant successfully demonstrated continuous manufacturing of high-purity lithium compounds at a production rate of approximately 1 tonne per day LCE. Mr. Cameron Stanton, Enirgi Group's Innovation Division's Divisional Director and VP, Technical, commented, "One of the characteristics of our processing technology is its lithium recovery performance. This means we capture more lithium atoms out of the lithium brine pumped from the well-field," said Mr. Stanton. "Current industry processing technologies usually range between 40 to 60%, with the average in the lower end of that range. Our approach has a proven recovery of up to 85% of the contained lithium. We have conservatively applied a recovery rate of 74% when defining the resource." Enirgi Group has invested significant resources and time in defining the mineral resources and reserves at the Rincón Project. Prior to the completion of the DFS, SRK has prepared separate NI 43-101 mineral resource estimates with effective dates as of December 19, 2011 (the "2011 Report"), October 28, 2013 (the "2013 Report") and December 23, 2014 (the "2014 Report") as well as a NI 43-101 Pre-Feasibility Study with an effective date of October 27, 2015 (the "Pre-Feasibility Study"). As a result, Enirgi Group has progressively improved its understanding of the Rincón Salar geology and the confidence level in its resource definition work from the first drilling campaign in 2009. The exploration results from the above programs were used by SRK to prepare the 2011 Report. In 2013, ADY conducted further diamond drilling and exploration campaigns in the central area of the Salar del Rincón which included further geophysical logging and brine aquifer testing. This resulted in the subsequent exploration results being used to prepare the 2013 Report. The 30-day pumping test was designed to better understand the characterization of brine flow in the Upper Fractured Halite for the 50,000 tonne per annum LCE plant and simulate future production well extraction rates. In 2015, based on these exploration results, Enirgi Group completed the Pre-Feasibility Study. Following the Pre-Feasibility Study, ADY and SRK conducted additional drilling and field investigations on the Salar del Rincón. The drilling programs increased the conceptual understanding and characterization of subsurface geology, with an emphasis on the detailed stratigraphy. This has led to an improved delineation of the porosity and transmissivity factors in measured and indicated resource category brine capacity, as well as the extractable resource from the Salar, resulting in the current mineral resource and reserve estimates. The 2010 and 2011 drilling programs, where one hundred and eleven (111) holes were completed, for a total drilling of 7,862 meters (4,143.75 meters in 2010 and 3,718.25 meters in 2011). Borehole depths range from 18 to 311.35 meters. 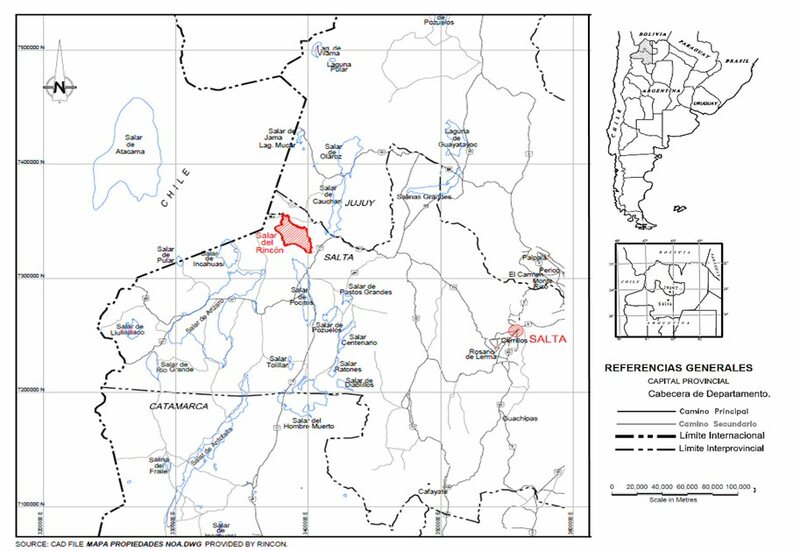 The 2013 exploration campaign, which focused on the Central Salar region with the purpose of expanding the resource area. The total drillhole length for this campaign was 1,265.5 meters, with hole depths varying from 30 meters for pumping wells to 125 meters for exploration holes. The 2014 drilling campaign, which focused on the drilling of a pilot pumping well, a nearby exploration hole and several monitoring wells to be used during a 30-day pump test. The total drillhole length for this campaign was 208 meters, with drillhole depths varying from 28 meters for monitoring wells to 48.5 meters for exploration holes. The 2015 drilling campaign, which focused on the deep (i.e., greater than 65 meters in depth) Black Sands within the halitic core. Enirgi conducted detailed logging, core sampling and 7-day brine aquifer tests at three different locations. The total drill hole length for this campaign was 744 meters, with hole depths ranging from 120 to 128 meters. The Salar del Rincón covers an area roughly 435 km2 with inner Salar area, termed the Halitic Zone, of approximately 232 km2. The halite crust area is essentially completely covered by ADY concessions and is the area used for the static resource estimation and remains the primary focus of brine evaluation on the Salar. The Salar core consists predominantly of a thick body of halite (NaCl), well developed and forming a hard cracked and upheaved salt crust (30 to 40 centimeters high), typical of a dry lake (Salar). The phreatic brine level currently lies some 40 to 50 centimeters below the salt crust. The Salar del Rincón is a very large, mature salar and displays substantial effective porosity and hydraulic continuity within the Upper Fractured Halite resource unit. The Black Sands resource unit also displays significant effective porosity with a lesser degree of verified hydraulic continuity. This Upper Fractured Halite resource unit accommodates relatively high brine extraction rates. The Salar is situated in close proximity to key infrastructure, including existing natural gas pipeline, electricity, rail and road transport that is required to build and support a large, scalable lithium processing facility. Water can be sourced from tenements owned by Enirgi Group, which is sufficient to sustain long term processing rates. Enirgi Group will construct a tie-in to the existing Gas Atacama pipeline connecting Chile and Argentina to supply power to support the Rincón Project (construction of the pipeline is included in the capital expenditure estimate). SWS developed a numerical groundwater model to mathematically incorporate the conceptual hydrogeology of the Salar del Rincón and evaluate the potential to extract lithium-rich brine from the Salar subsurface. The dynamic numerical groundwater model (the "Dynamic Model") was then used to develop a mine plan from simulation of the number of wells identified by the analytical well field design. The financial results are derived from annual inputs based on an annual mining schedule included in the DFS. The mining schedule of the reserves declared in the DFS are planned to be exploited between the latter half of 2018 and the end of 2042, granting the Rincón Project an expected life span of approximately 24.5 years. Cash flows are reported on a yearly basis and all financial data is expressed in United States dollars as at first quarter 2016. Roskill Consulting Group Ltd. ("Roskill") and Mr. Joe Lowry of Global Lithium LLC ("Global Lithium") contributed to the lithium market information and price forecasts relied upon in the DFS. Both Roskill and Global Lithium are independent of Enirgi Group. Roskill is a UK-based research consultancy with substantial expertise in international metals and minerals. Enirgi Group retained Roskill to provide updated minerals research and market information for lithium (as of January 2016). The Rincón Project will utilize Enirgi Group's proprietary lithium extraction technology. Raw brine will be extracted from the Salar through pumping from recovery wells strategically placed to maximize recovery of the resource within the Salar. Pumping rates, locations and area of influence for extraction wells were estimated based on hydrogeological parameters calculated for each geological formation based on field testing results and supported by simulation utilizing the Dynamic Model. Production well discharge varied from year to year, with an average rate of 1,450 litres per second and an average annual variation of +/- 98 litres per second. The proposed plant will have the capacity to produce 50,000 tonnes LCE per annum. To achieve this, a brine containing approximately 350 to 500 milligrams per litre ("mg/L") lithium will be pumped from a series of wells in the Salar to the process plant, where impurities are removed and the lithium is refined and converted to a lithium carbonate. The technology enables lithium extraction from raw unconcentrated brine and returns the spent brine with a very similar elemental composition with the exception of lithium. This removes the need for brine concentration which is usually made via a large area pond system reducing the mining area footprint and environmental impact relative to conventional technologies. The chemical processes main reagent inputs are cost-effective natural gas and limestone with the carbonate requirement needed for the end product being manufactured from carbon dioxide flue gases from the power station reducing carbon emissions to the environment. There are no large amounts of solid waste generated from the plant as all impurities remain in the spent brine, this attribute solves many scalability and environmental problems usually encountered with material handling and storage of these wastes at the mine site. In the second half of 2015, the demonstration plant was disassembled and its modular parts were shipped from Sydney, Australia to the Salar del Rincón in Salta Province, Argentina. The Company is currently focused on continued work to support its goal of recommissioning and expanding the plant to test and demonstrate the full lithium extraction process and technology on site including finalizing the commercial plant design, commencement of detailed plant engineering, and engineering activities relating to gas supply and construction of a gas pipeline for the 50,000 tonne per annum Rincón Project. Proven technology - validated by leading independent international technology organization. Exhaustive studies and technical peer reviews completed. Proprietary technology dramatically decreases production time from 365+ days to 24 hours. Brine hydrology and water balance. Host aquifer and brine body definition. Enirgi Group holds exclusive mineral claims over nearly 100% of the economic halitic zone. Enirgi Group maintains a large block of mineral claims related to an adjacent limestone resource. There are no material risks or uncertainties associated with Enirgi Group's ownership of the brine. Federal and Provincial permits associated with the operation of the on-site pilot plant for lithium carbonate production obtained. Clear strategy and plan in place to carry out execution of the 50,000 tonne per annum Rincón Project. Strong global track record of successful project execution across Enirgi Group's assets and operations. Strong local presence and positive relationships with Federal and National Government entities. SRK reviewed the historical and contemporary data sets relevant to the resource model. Drillhole data was audited by SRK before use in development of the geological model representing the drillhole and assay database for the Rincón Project. The data audit included review of: assay certificates, hard copy records of the downhole survey results, logging codes for consistency, logging codes for lithology and checks for data logged, sampled or otherwise measured past the end of the drillhole. SRK corrected verified errors in the database. The resulting 2015 drillhole and assay database is considered of high quality and acceptable for use in resource estimation. The Salar del Rincón covers an area roughly 435 km2 with inner Salar area of approximately 232 km2. The halite crust area is essentially completely covered by ADY concessions and is the area used for the static resource estimation and remains the primary focus of brine evaluation on the Salar. The resource estimate for the Salar is based on drilling, brine assays, porosity determinations from core and specific yield as estimated by pump tests conducted by ADY and monitored by SRK and/or SWS, and dynamic modeling completed by SWS. Physical properties of the brine such as density, total dissolved solids, and pH were measured by both the ADY laboratory and external independent laboratories (e.g., ALS Laboratory Group and Alex Stewart International). Brine aquifer tests conducted to date show that, within a relatively short duration of start-up, the brine from the pumping well homogenizes the assay differentials that are present downhole. Statistical testing on the assays from the upper portions of the drillholes show that downhole averaging is valid for lithium and potassium. Brine aquifer tests indicate that the near surface (i.e., less than 65 meters in depth) "communication" between holes within the Upper Fractured Halite unit is unrestricted and that widespread, impervious clay layers are not present. Resource recovery factors utilized to calculate reserves include the following: wellfield performance (i.e., in situ recovery of resource from brine); recovery of rejected stream from the brine beneficiation stage; lithium extraction plant process recovery; and environmental permitting. The resource estimate is not anticipated to be materially affected by known environmental, permitting, legal, title, taxation, socio-economic, marketing, political, or other relevant factors. The 2016 NI 43-101 Technical Report was authored by Qualified Persons Mr. Jerry Aiken, Registered SME, Senior Associate Geologist, SRK; Mr. Terry Braun, P.E., Principal Consultant, SRK; Mr. Tyler Cluff, P.G., Senior Hydrogeologist, SWS; Mr. Douglas Collier, Fellow AusIMM, Principal Engineer, ANSTO, Hugh D Thompson, B. Eng. (Mining), FAusIMM, Prudentia Process Consulting and Mr. Jeff Osborn, BEng Mining, MMSAQP, SRK. All persons are Qualified Persons, independent of Enirgi Group within the meaning of NI 43-101. The scientific and technical information contained in this news release has been reviewed and approved by Mr. Terry Braun, P.E., Principal Consultant, SRK. The 2016 NI 43-101 Technical Report was prepared in accordance with NI 43-101 and Staff Notice 43-704 of the Ontario Securities Commission. Enirgi Group is a global, diversified industrial and specialty chemicals company that owns and operates a portfolio of world-class assets and operations located around the world. Part of Enirgi Group's Chemicals Division, ADY operates at the Salar del Rincón in the province of Salta, Argentina. (1) Average specific yield is approximated by the weighted average of individual lithologic specific yield estimates for each stratigraphic unit. Each estimate of specific yield is based on physical testing of representative core samples, short-term (e.g., 1 to 3 days) and/or long-term (30 days) brine extraction tests. (2) Average thickness identified for entire stratigraphic unit, not redefined by depth boundaries of measured, indicated, or inferred resource. (3) Assigned cut-off grade for the brine process is 200 mg/L as lithium. (4) Total brine volume is not equivalent to the total extractable brine volume. Brine extraction via engineered production wells is a function of the hydraulic properties (e.g., conductivity, saturated thickness and continuity) of each stratigraphic unit within the brine resource areas as well as the overall water balance for the hydrogeologic basin. These properties are simulated in a 3-dimensional numerical model which allows estimation of the extractable brine resource as declared in the mineral reserve statement. (5) LCE calculated as a multiple (5.34) of the estimated lithium as metal value. (1) All mineral resources are inclusive of mineral reserves. (2) Mr. Jerry Aiken, P.G., R-SME, is an associate of SRK. He is an independent Qualified Person for purposes of NI 43-101 and he supervised the preparation of and verified the above mineral resource estimate, including the underlying sampling, analytical, test and production data. Data was verified by, among other things, multiple site visits and data audits. (3) Mineral resources which are not mineral reserves do not have a demonstrated economic viability as of the effective date of the 2016 NI 43-101 Technical Report. (4) Table entries are rounded to reflect the precision of the estimate and differences may occur due to this rounding. Tonnes refers to metric tonnes. (1) Estimated by 23% rejection rate of lithium mass during brine beneficiation, and subsequent 60% re-capture of re-infiltrated lithium in reject brine. 77%+(23% x 60%). (2) Recovery estimate provided by ANSTO. (3) In situ recovery factor estimated by drawdown calculated by the Dynamic Model. High transmissivity and bowl shaped geometry are conducive to dewatering the unit. (4) In situ recovery factor estimated by drawdown calculated by the Dynamic Model. Production from Black Sand units enhance drainage from overlying units. (5) In situ recovery factor estimated according to Houston, 2011. (6) In situ recovery factor estimated by analytical solution for wellfield using Black Sand-series aquifer parameters. (7) Massive halite unit is defined entirely as an inferred resource. Production potential from the unit is low, owing to its competent crystalline matrix and low permeability. (1) Assigned cutoff grade of 200 mg/L lithium. (2) The cut-off grade at which lithium extraction is no longer economic is varied based on a number of recovery and cost factors including the geologic formation from which the extraction is occurring, the concentration of deleterious elements such as magnesium in the raw brine, raw brine pumping/processing capacity in the lithium plant and the lithium pricing assumptions. (3) Mr. Tyler Cluff, P.G., is an employee of SWS. He is an independent Qualified Person for purposes of NI 43-101 and he supervised the preparation of and verified the above mineral reserve figures, including the underlying sampling, analytical, test, and production data. Data was verified by among other things, a site visit. The upper fractured halite is the uppermost unit on the Salar and averages 16.2 meters thick with a range of depths from 0 to 30 meters. It is composed almost entirely (+98%) of halite (NaCl) that has been highly fractured and contains various volumes of dissolution cavities which are, for the most part, interconnected. This unit occurs as wedges of mixed sands and clay beds, usually along the margins of the Salar, but sometimes extending well into the Salar as intermittent channels. These normally do not reach the central Salar area. The materials are primarily composed of weathered volcanics and contain a fair amount of clay, which gives them poor transmissivity and specific yield. The average thickness of this unit is 13.6 meters with variations from near 0 to about 20 meters. This unit is similar to the above Clastic Unit, however it possesses a greater volume of un-fractured halite. The specific yield and hydraulic conductivity is also lower, as is the porosity. The clastic portion of this unit is similar to that of the above unit, with local sections containing slightly more clay fractions. The average thickness of this unit is 15.7 meters, with variations from less than 5 to 25 meters. This unit is found universally across the Salar between depths of 40 meters to +/- 100 meters with an average thickness of 72.5 meters. The Black Sands SSU is thicker on the western portion of the Salar and thins eastward. Individual sand beds are typically observed to be 1 to 5 meters thick and interbedded with halite beds. However, on the western portion of the Salar, the Pure Black Sand beds can be as thick as 13 meters. A number of discrete layers of sand beds and halite are found within the Black Sands SSU, but are laterally discontinuous across the Salar, a thinning and transitioning into competent beds of halite. This has the effect of compartmentalizing Black Sand beds resulting in discrete areas of higher transmissivity separated by very low to non transmissive horizons. The Massive Halite Unit makes up the largest volume of the entire Salar and is only classified as an inferred resource although there is interstitial brine within the unit. The porosity is measured at 0.018 (1.8%) and due to the depth, low transmissivity and total volume this unit is not economic at this time. This news release contains forward-looking statements about the Company, the Rincón Project and its business. Forward looking statements are statements that are not historical facts and are based on certain assumptions relating, but not limited to: resource estimates, estimated NPV, anticipated IRR, anticipated mining and processing methods for the Rincón Project, the estimated economics of the Rincón Project, anticipated lithium recoveries, production and plant capacity rates, lithium grades, estimated capital costs, operating cash costs and total production costs, construction and supply of the necessary energy required, planned additional processing work and permitting. While the Company considers these assumptions to be reasonable, based on information currently available, they may prove to be incorrect. The forward-looking statements in this news release are subject to various risks, uncertainties and other factors that could cause the Company's actual results or achievements to differ materially from those expressed in or implied by forward looking statements. These risks, uncertainties and other factors include, without limitation, risks related to uncertainty in the demand for lithium and pricing assumptions; uncertainties related to raising sufficient financing to fund the project in a timely manner and on acceptable terms; changes in planned work resulting from logistical, technical or other factors; the possibility that results of work will not fulfill expectations and realize the perceived potential of the Company's properties; uncertainties involved in the estimation of lithium reserves and resources; the possibility that required permits may not be obtained on a timely manner or at all; the possibility that capital and operating costs may be higher than currently estimated and may preclude commercial development or render operations uneconomic; the possibility that the estimated recovery rates may not be achieved; risk of accidents, equipment breakdowns and labor disputes or other unanticipated difficulties or interruptions; the possibility of cost overruns or unanticipated expenses in the work program; and risks related to projected project economics, recovery rates, and estimated NPV and anticipated IRR and other factors. The terms "mineral reserves," "probable reserves," "inferred mineral resources," "indicated mineral resources," "measured mineral resources" and "mineral resources" used in this news release are Canadian mining terms as defined in accordance with NI 43-101 under the guidelines set out in the Canadian Institute of Mining, Metallurgy and Petroleum (the "CIM") Standards on Mineral Resources and Mineral Reserves (the "CIM Standards"). The CIM Standards differ significantly from standards in the United States Securities and Exchange Commission ("SEC") Industry Guide 7 under the United States Securities Act of 1933, as amended. While the terms "mineral resource," "measured mineral resources," "indicated mineral resources," and "inferred mineral resources" are recognized and required by Canadian regulations, they are not defined terms under SEC Industry Guide 7 and are not normally permitted to be used in reports and registration statements filed with the SEC. Under United States standards, mineralization may not be classified as a reserve unless the determination has been made that the mineralization could be economically and legally produced or extracted at the time the reserve determination is made. Readers are cautioned not to assume that any part or all of measured or indicated mineral resources will ever be converted into reserves. Further, inferred mineral resources have a greater amount of uncertainty as to their existence and as to whether they can be mined legally or economically. It cannot be assumed that all or any part of the inferred mineral resources will ever be upgraded to a higher resource category. Under Canadian rules, estimates of "inferred mineral resources" may not form the basis of feasibility or pre-feasibility studies, except in rare cases. Therefore, readers are also cautioned not to assume that all or any part of the inferred mineral resources exist, or that they can be mined legally or economically. The "reserves" reported by the Company in accordance with NI 43-101 may also not qualify as "reserves" under SEC Industry Guide 7. As such, information regarding mineralization and resources contained in the news release may not be comparable to similar information made public by United States companies subject to reporting and disclosure requirements under United States federal securities laws and the rules and regulations promulgated thereunder.